It’s rarely that this blog sees much to agree with in Chambers of Commerce and Tourist Associations across the Scotland and the rest of the world but praise should be given where it is due. So, it must be right for Drumnadrochit’s Association to have circulated a letter by one of its long time business members (boat skipper George Edwards) who is evidently very concerned that some local formally unqualified pseudo scientists seem intent on pushing plankton & floating wood on the public rather than looking for the Loch Ness Monster and “bigging up” the mystery. Let’s be quite clear: People know Loch Ness around the world because of the fame of the Loch Ness Monster, not because some ageing pseudo scientists, many of whom originally came to find Nessie but personally failed to find her, now want to use captive museum audiences to push a message about microbes and worms that many probably don’t want to hear; at least not while on holiday in Nessie’s supposed home village! Veteran monster hunter and expert George Edwards is a well respected boat skipper who has probably ferried tens of thousands of visitors out onto Loch Ness to learn about the magic of Nessie, her caves and the unknown mysteries in the deep dark loch. He is always talking up the chances of seeing Nessie and maybe one day finding her. What he doesn’t do is ape some of the debunkers by advertising his boat as a Nessie attraction and then feeding negativity about Nessie down his passengers gullets based on the non academic background of hobbyists and others. George’s approach is therefore “Nessie, I believe” rather than “Nessie, she’s not real. Thanks for your money but she’s all just fiction so have some micro worms and a floating fence post instead. Oh and here’s the gift shop on your way out”. This debate is important for the future of Drumnadrochit and all of the businesses within it. The world is full of cynics, bitter failures and debunkers in all spheres of existence and people visiting Drumnadrochit want to experience something more akin to the magic of Lapland and Father Christmas than a sombre museum monologue on pond life. So on this occasion well done, Drumnadrochit Chamber of Commerce and Tourist Association for taking a pro Nessie stand. But don’t let it be a flash in the pan. Strive to encourage all the museum owners to considerably up their game, consider dispensing with yesterday’s formally unqualified Nessie naysayers and start fighting for the recovery of the all important pro Nessie tourism for every business in the area. The twilight zone has well and truly moved into this year’s silly season Drumnadrochit, Loch Ness with news breaking in the Scottish Daily Record newspaper and also in the Highlands Press & Journal that local Loch Ness exhibition owner Donald Skinner has been arrested and charged by police for allegedly stealing a rival museum’s advertising sign. Veteran entrepreneur Mr Skinner, 70, reportedly denies the theft, stating that he wrote repeatedly to his neighbouring museum’s owners to complain that their sign was blocking his own requesting that it be moved. He alleges they they failed to respond and so he warned them that he would “take custody of their sign” if they continued to ignore his requests. Upon being arrested, Mr. Skinner says he told police that he “hadn’t stolen the sign under Scottish law” – worth, he says, about £30 (35 euro) but “had custody of it”. Police say the matter will be reported to the Procurator Fiscal, the legal office which determines whether and how to proceed with criminal cases in Scotland. There seems to be some desperation amongst businesses as, according to official data (and the obviously visible dwindling footfall in the village) tourist numbers have plummeted. Earlier this month the Drumnadrochit Chamber of Commerce and Tourist Association circulated a letter from long established and highly respected boat skipper George Edwards who was highlighting his concerns that the museum that is now accusing Mr Skinner of theft was itself being very negative about Nessie our famous Loch Ness Monster in its exhibits (apart from dumping tourists straight into a Nessie gift shop as they exit). Perhaps Drumnadrochit needs an outbreak of common sense but there are a lot of apparently bitter old monster debunkers around and Highland feuds aplenty) so it’s unlikely that peace will break out any time soon. In the meantime the silent majority can only look on in despair as a childish war escalates, which the fragile tourist trade here needs like a hole in the head. Perhaps it would be better for younger hearts and minds to push the bitter looking and seemingly failed and washed up old big beasts and pseudo scientists aside and start actually and actively promoting Nessie, The Loch Ness Monster. What do you want to see? Debunking info and “facts” from non-academically trained folk about plankton and old wooden fence posts or the mystery and magic of the unknown monster who lives in the enormous dark depths of mysterious Loch Ness? 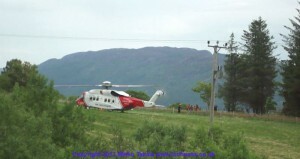 They weren’t looking for Nessie but police & Mountain Rescue were called into action on Sunday 16th June to search for a hill walker who was feared missing in the mountains overlooking Loch Ness. The rural community was stunned when a massive air-sea rescue helicopter suddenly landed in a field to transport members of the rescue service. It’s great to know that residents and visitors to the area have such a dedicated rescue team in the vicinity. You could be forgiven for expecting to hear a PA speaker bellowing out “Good Morning Vietnam” from the village green as the four horsemen of the apocalypse bring Monster Geddon to the normally quiet Loch Ness side village of Drumnadrochit. A Great Glen sized schism seems to have opened up between believers and naysayers over the existence of our beloved Nessie and the possible impact old museums and other places have on tourism to the area if they down play her existence. “It’s like Channel 4’s ‘Homeland’ has come to our village. Normally normal sorts of people seem to be issuing fatwas and proclaiming they have the one and only Loch Ness Monster Truth & Orthodoxy viz-a-viz Nessie”, said Professor Kettle. 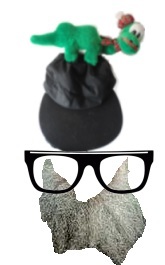 “I seem to see Osama Bin Laden lookalikes all over the place and with past newspaper reports of Nessie wars involving Molatov Cocktails and other shenanigans one has to wonder what on earth is happening”. “I know the sun has made a rare appearance and people can go silly season daft but it’s a fact that nobody has ever proved the Loch Ness Monster does not exist – certainly not non scientists and Loch Ness hobbyists”. b) Nessie is just a plankton stuck to a floating gate post and she doesn’t really exist. Unwary passers-by risk getting their heads shot off by either side if they venture onto the “forbidden lawns” (ref. Arthur Daley’s “manor” in “Minder”). A spokesperson for the silent majority told us, “I know what I’ve seen and it wasn’t a old plank some joker tossed off Urquhart Castle”. The truth really can be stranger than fiction. Open warfare seems to have broken out between villagers over the existence or otherwise of Nessie, The Loch Ness Monster. Oliver Cromwell & Rob Roy had nothing on all this! The Inverness Courier and other newspapers have been reporting on the hostilities. Maybe it’s time for the Blue Berets of The United Nations Peace Keeping Force to move onto the village green! Do you visit Loch Ness to look for our monster or do you really really want to travel here to see old museums about mud, mini eels and pseudo scientific research into how your eye might “interpret” a floating gate post? To us it’s a no brainer, so rock on Boat Skipper George Edwards who always gives a great Nessie experience and the incomparable “Nessieland” on the Beauly turn off in Drumnadrochit. You really don’t need to make it up in Drumnadrochit, Loch Ness – at least that is our opinion after reading today’s Daily Telegraph and Inverness Courier newspapers. In an apparent fit of pique, veteran Loch Ness monster myth “poo pooer” Tony Harmsworth has quit his position as website editor for the Drumnadrochit Chamber of Commerce and Tourist Association. He reportedly did this because fellow association member and long time local tour boat owner & operator George Edwards issued a fierce critique of the long-in-the-tooth (and formally unqualified “naturalist” – a word we can all apply to ourselves by virtue of the fact that we also breathe air) Adrian Shine’s Loch Ness museum on the A82 Inverness -Fort William road (see the Daily Telegraph report here). According to the Inverness Courier Mr. Shine’s museum has also quit the chamber. It’s all quite tragic but also very funny – seemingly like a Shakespeare / Mr Bean combo farce. George reckons that the museum may be putting off many visitors by seeking to debunk Nessie and we agree with him. Nessie is an unknown Loch Ness Monster; a cryptozoological beast, the non-existence of which has never been proven and certainly not by hobbying naturalists. We always suggest people to the area visit the apparently superior and pro Nessie “Nessieland exhibition” which is on the Beauly & Cannich road (turn out of Drumnadrochit). In our opinion the museum piece on the A82 Inverness – Fort William road is now way past its best days in both content and presentation and seems not positive about the Nessie myth.